Don't tell Sacramento, but guess who's the inspiration behind my outfit today? (Hint: the reigna in Spain-a flies mainly on a plane, ah) From London to Berlin to sunny Espana, the charms of Sacramento bloom where ever she visits. And, who else can pull off such a frenzied mix of colorful florals with such a grand gesture of love + sunshine? Nobody, that's who! But that doesn't keep us from trying. Show Mis Papelicos some love on her Facebook page by clicking HERE. This post is part of Visible Monday. You can see more powerful statements of visibility over at Patty's Not Yet Dead Style. It's great that you're taking part in Visible Monday and inspired by Sacramento to boot! I love the jacket and can only imagine all the loot you're carrying with three bags. You look fabulous! I love your smile in these photos! Way to channel our fave Spaniard. Great inspiration and I love how your fit came together. All the prints and the rad booties! I wanted to give our daughter "Sacramento" as a middle name, still working on that with Nacho. Problem is, his last name is Salinas. So it might sound like a California map. Sacramento Salinas? I still like it though. a lot. It took me a minute to notice that that was a flower headband, i thought your hair had just gone BIG! Love the outfit, what a great way to channel sacramento! you have the most unique style!! i absolutely adore all those patterns and colors!! gorgeous boots and tights!! amazing jacket too!! Your interpretation of Sacramento is so beautiful! I think the patterns you've chosen mix really well because of the difference in size and colour - well done! Sacramento is my hero too! you look beautiful in colours. I have never tried to mix that much patterns and still look so good. Your smile brightened up my rainy day here. What a great homage to a vibrantly wonderful woman! Though when I saw the flower headpiece I also thought thought of another wonderful woman: Desiree of Pull Your Socks up - and scrolled to the end to see that it is indeed one of her fabulous creations. I want a closer look at those electric blue ankle boots too. Showing my love to Miss Sacramento and Bella la Bellissima! Carmen Miranda is my hero! You made me happy! The floral headpiece is so fun! You carry it well! Wonderful homage to a glorious lady! You look fabulous in all your florals, and wow, your smile is killer-gorgeous. Ah! Blooming MADLY! Love, love, love. 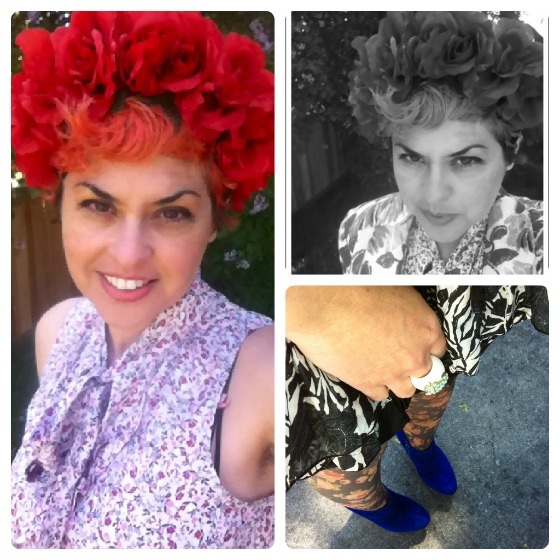 Love Sacramento, and love your inspired sartorial tribute! That headpiece just takes it to a whole 'nother level! Stunning tribute to the creative and constantly inspiring Sacramento! You channeled her spirit with perfection. 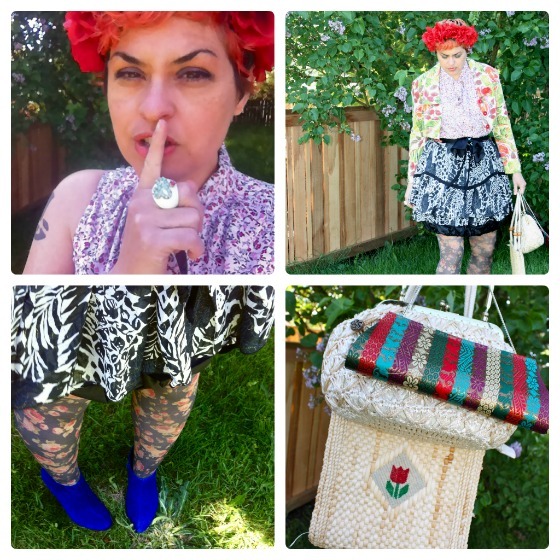 Triple bags with Sassy Vamps floral head piece that carries the color of your hair to a new level - priceless! Ahhhhhhhhhhhhhhhhhhhhhh (screaming o joy)I cannot believe this post, ahhhhhhhhhhhhhhhhhhhhhhhh. I am in Málaga at the moment and I am jumping about, ahhhhhhhhhhh. I am soooooooooo honoured, my dearest sister del alma. Love Ritee's taste in handbags. You've got the most beautiful smile. You look beautiful in all your florals, Sacramento is always an inspiration. Oh, what a fabulously scrumptious posting! You are an explosion of positive energy, colour, light! Wonderful!! You've captured the essence of beautiful Sacramento in this oh-so-alive tribute. I love the Sassy Vamps piece with your hair, and your multiple bags are inspired. 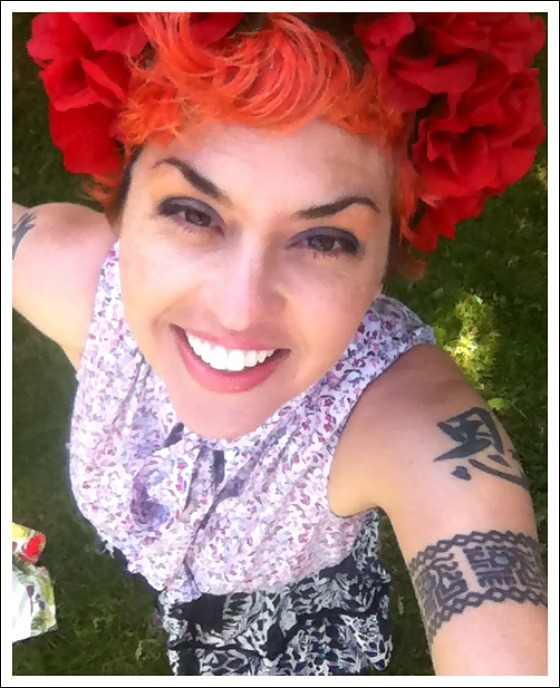 I love the way your rose gorgeous headband blends in with your fabuloso red hair. You captivated her floral look so well.Oh yeah! Your three bags are inspiring me amor. Love all that floralized & colorful outfit!, and love your inspiration on Lady Sacramento, The Queen of Skirts!, and your smile is gorgeous! How in the heck do you do this? This is a stroke of pattern madness and cuteness. I am mystified...but bow down to you. Love it!! What great pictures, too. You have such a gorgeous smile. Beautiful tribute Bella you are in full bloom. She will love seeing this! What a fun outfit! I do love sacramento's style and you look very pretty with flowers in your hair! You are so stylishly brave and awesomely stylish! And yay for Sacto! I love your hair with those red roses ! And the color of the blue shoes caught my eyes !!! Ahhhh, you look amazing! 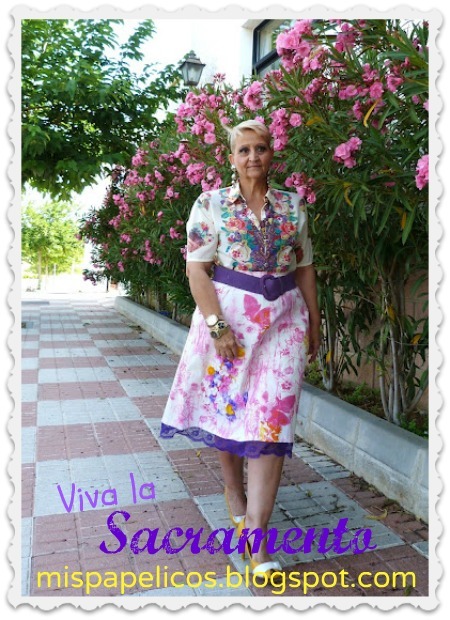 This outfit is incredible, and the lovely Sacramento is well worth a nod.